Clearly, the Oklahoma Republican Party watched with glee, and did all they could in the background, to promote the Tea Party as it developed into a collection of thugs that carried out their dirty work, rallying with ugly, insulting signs and making threats to Democrats and moderate Republicans in our legislature. It was not incidental that this happened directly after the election of our first black president. Not unlike the industrialists in inter-war Germany funding and using the rising Nazi Party to muscle in their agenda without showing their faces publicly, the Republican Party wanted to keep its respectability while hammering those who stood in the way of their corporate, totalitarian vision for Oklahoma. That’s where the Tea Party came in. They became the bullies that the Republican Party in Oklahoma could use to their advantage when possible and disown when they created public problems for the GOP. 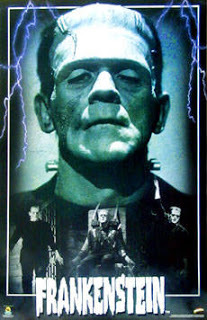 But just like Frankenstein’s monster, once a political group has been created, there is no assurance of future control. Senator Cliff Branan found that out last year. According to a news report today by The Oklahoman, Al Gerhart, an Oklahoma City carpenter and local Tea Party leader, is being charged with two felonies, blackmail and violating the Oklahoma Computer Crimes Act, because of an email sent to Republican Senator Cliff Branan who lives in Nichols Hills, a posh, well-manicured city within a city surrounded by the expansive Oklahoma City. I have to admit to being amused that Branan, who has been in the legislature for a number of years now, is frightened and incensed at getting an email threatening to dig into his personal and family members personal backgrounds to dig up dirt on him. The threat was centered on one of dozens of bills introduced every year that have something to do with defending Oklahoma against that dreaded United Nations. I support Branan in his refusing to have his committee consider yet another wacky bill inspired by conspiracy theories. What seems strange and downright whiny is his taking yet another fired up Tea Party leader to court on felony blackmail charges. Would Branan have the same reaction if that same email had been sent to a Democrat in our legislature? Oh, wait. Democrats and Republicans have, and still do receive identical threats every year. This is in addition to the outright threats of physical violence issued through anonymous blog posts, forum posts, and phone calls. If Branan and other Republicans are serious about stopping this behavior, it is time for them to speak up and take action when anyone is on the receiving end. Tea Party bullying is not the way that a legitimate political party does business. It’s time for the Republican Party to quit using the Tea Party as the enforcers. But, for now, Frankenstein’s monster has turned on it’s creator. Republicans, behold your own creation and be afraid!